The Walking Dead is a hugely popular show and has just begun its fourth season. 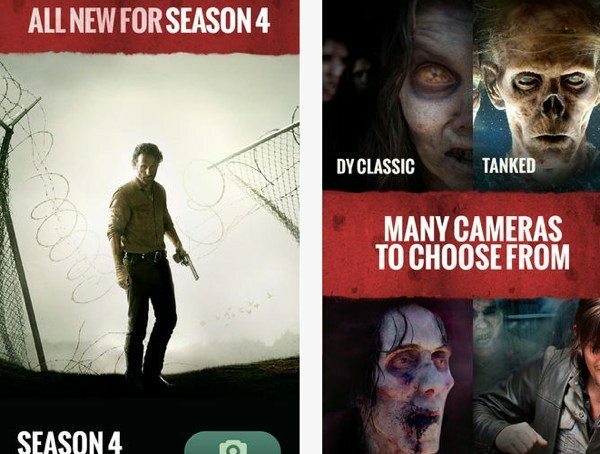 This horror drama TV series has been a massive hit and to mark the beginning of the new season the official AMC Walking Dead app for Android and iPhone has now received a significant update. Walking Dead app users can take a new image or import one and add props from the TV series and realistic zombie parts. The latest update adds over 100 parts and props to create different Walker combinations, though users should be aware that the high-resolution parts might take several minutes to download. This app is bound to be appealing to the many Walking Dead fans out there, and there’s also a Bite a Friend feature. Photos can be posted to the Walker Photo Gallery and app users can then vote on their favorite most gruesome or awesome images. Sharing options include Facebook, Twitter and more, and now Instagram and Tumblr have been added. You can find the iOS version of The Walking Dead: Dead Yourself app at iTunes here, which brings fixes and additional translations. It’s a free app compatible with iPhone, iPad or iPod touch running iOS 5.0 or later. For the Android app head to Google Play here. This is compatible for devices running Android 4.0.3 or later. Are you already using the official free Walking Dead app? If so why not let us know what you think of it by sending your comments. Perhaps you’ve decided to head to the App Store or Google Play to download the Walking Dead: Dead Yourself iOS or Android app now?